We departed Birmingham International at 6:40 am, March 26th on Continental Airlines. Flew to Houston, then Honolulu, then Guam, and finally landed on Moen Island, Truk Lagoon, Federated States of Micronesia. We were in the air a total of about 20 hours. Our arrival in Truk was about 5:30 am, March 27th, Alabama time. There was another group of divers on the plane from Ohio and Virginia. They were headed for the Truk Aggressor. Steve doesn't think much of the Aggressor or the Odyssey; says he doesn't like diving with yuppies. The Thorfinn crew met us on our arrival at the airport and proceeded to take care of all of our bags and dive gear. Maricar, a cute little girl that handles all the reservations on the Thorfinn, presented each of us with a very sweet smelling marmar, which in Hawaii is called lei. The arrival of the American divers at the Moen airport appears to be a regular social event for the locals. There were women and men of all ages there and they seemed to be very interested in the new arrivals. The women mostly sat around in their brightly-colored long skirts, chattering non-stop while chewing their betel nut and spitting its purple juice. They really got a kick out of having their picture taken. Most of the men just kind of stared, but were friendly when spoken to. They like to decorate themselves with tattoos, earrings and gold teeth. The Thorfinn crew busied themselves with getting all of our gear loaded. Then we proceeded through the streets of Moen Island to the harbor. Even though it was dark, it was apparent that Moen Island and Truk Lagoon are very poor areas. Most of the houses are just dilapidated old shacks and the road, though it appeared to be paved, was full of potholes and standing water. Our driver proceeded at a snail's pace through the bumpiest areas. The truck was so loaded down with our gear he must have been afraid of breaking the springs. It must have been about midnight when we boarded the Thorfinn. There we met Captain Lance Higgs and the rest of the crew. Captain Higgs is a most interesting fellow. A Canadian by birth, he has spent time all over the globe and has found his home in Truk. His love of the sea and big ocean-going ships is very apparent. He gave us a briefing for about an hour and a half that covered everything from how to flush the toilets to diving procedures. After this, we were completely zonked out and everyone headed to their assigned cabins. Day One started with a sweet roll and coffee at about 6 am. Every morning about 5:30 am, the girls would have coffee and sweet rolls in the lobby area of the ship for the early risers. This was a great time to get awake and read some of the history books about Truk Lagoon. The formal breakfast followed at about 7 am. The cooks and waitress would greet you with "nessor annim", meaning "good morning", as you entered the dining room. There was fresh watermelon, cantaloupe, grapes and apples, as well as cereal on every table at breakfast. A real, traditional breakfast could be ordered from the menu. Bacon, two or three types of sausage, eggs, regular toast and french toast, and pancakes were available. But the most popular item were the omelets, made any way you wanted. The ham, cheese and onion omelet was delicious! After breakfast it was time to get ready to go diving. The crew would already have your BC on a full tank, so it was just a matter of donning your wet suit and climbing down the ladder into the dive boat. We utilized four dive boats numbered Port1 and Port2, and Starboard1 and Starboard2. Each boat carried five or six divers. Only two boats would be at any one dive site, and they would be staggered 30 or 45 minutes apart. So there were never too many divers on a wreck at once, unlike the other boats operating in the area that may dump 20 or 25 divers on one site. Having a small number of divers on a site at one time is important because, in addition to just getting in each other's way, the wrecks are full of easily disturbed sediment that impairs visibility very quickly. And we all know that good viz is what it’s all about. Our first dive was on the Nippo Maru, a 352-foot cargo ship sitting upright on the ocean floor at 165 feet. Betewen, our dive guide, anchored to the bow and that's where we dropped down to. After a descent of only a few feet, the murky outline of the huge ship below came into view about 80 feet below. That is the appeal of Truk; crystal clear warm water and over 40 wrecks on which to dive! The first thing I noticed was an old 40's model truck frame hanging off the side. The thin body has long since rusted away. A little forward of this toward the stern, you could look down into a cargo hold full of mines and shell casings. Proceeding toward the bridge, a small, three-man tank was sitting there just like it had been loaded over 60 years ago! (Only it never got to be off-loaded to fight against our troops, thanks to an American torpedo). A prior diver had placed a gas mask right on top of the tank. The bridge was very interesting and a little eerie. You could swim in and see two engine telegraphs standing there just like they were left (these were used by the commander to "telegraph" what the ship's speed should be down to the engine room). Because of all the brightly-colored coral and the light gray-blue light filtering through the openings, this was a popular spot for underwater photos. Max. depth - 128 feet; dive time - 33 minutes. Our second dive of the day was to the Heian Maru, a huge, 510-foot passenger luxury liner that the Japanese converted into a submarine tender for wartime usage. It lies on its port side in 120 feet of water. We descended right onto the name of the ship on the bow, still plainly legible in both English and Japanese characters. Apparently, periscope tubes on Japanese subs had to be replaced fairly often because there were many of them in the cargo hold of this ship. There were also several twin-screwed torpedoes. Also strewn about the entire wreck were bottles, plates, cups and pitchers. Some of the plates and cups had detailed designs on them. Oh to have one for your display case at home! But everyone knows that this is strictly prohibited and close-up photos will have to do. Max depth - 112 feet; dive time - 46 minutes. After the second dive it was time for lunch. Lunch was always a big meal, big enough for the evening meal. Today we had a big thick pork chop, cold slaw and mashed potatoes. The pork chop was delicious. Then it was time to stretch out in the lobby for a quick nap before the first dive of the afternoon. Our third dive was to the Fujikawa Maru, one of the most popular dives in the lagoon. It is a must dive. The engine room and machine shop penetration were very interesting as well as somewhat spooky. Made pictures of the engine machinery, a grinder and a vise. It was black dark without a light. Then we went into another room full of crushed steel drums. One of the cargo holds contained intact zero fighters. These fast planes dominated the skies until we came out with the Hellcats in 1943 and put them back in their place. We took turns sitting in the cockpit of one of the zeros holding onto the control stick and having our picture taken. On this dive we also saw something somewhat disturbing--a human skull. These wrecks had to be full of human remains but the Japanese recovered a lot of them, took them back to the homeland, and cremated them. There is a fine line here between honoring the dead and showing the proper respect. Anyway, our dive guide set the skull and two long bones on the wing of one of the zeros. The cause of death was readily apparent--a huge whole about the size of a half dollar in the back of the skull. Even though he was one of the enemy, one can't help but feel sympathy for the guy and wonder what he went through. Did his family back home ever know what happened to him? Then we swam along the deck and saw the big deck gun all encrusted with coral, and saw the memorials to the Fujikawa Maru and Kimiuo Aisek, a local resident that was forced to work for the Japanese and who witnessed the attack on Truk Lagoon. He later became a diver and discovered many of the wrecks. Max. depth - 92 feet; dive time - 50 minutes. A Betty Bomber was the fourth dive of the day. Located just off the end of the Eten Island runway, it lies in about 65 feet of crystal clear water. The fuselage and tail section are located together, but the engines and attached propellers are about 75 yards away. Betewen was able to lead us right to it. It must have been a very violent crash. According to "World War II Wrecks of the Truk Lagoon", 38 incendiary bombs were removed from the plane to make it safer for divers. Max. depth - 65 feet; dive time - 39 minutes. We started our day with a trip to the Hoki Maru at about 8:30, after a big breakfast. The Hoki is unique because it is the only ship sunk at Truk that was captured by the Japanese. It was originally a New Zealand ship and was captured by the Aikoku Maru and the Hokuku Maru. It is lying upright on the bottom in about 175 feet of water. Most of the bow was destroyed by a huge explosion of aviation fuel it was carrying. In the past, divers have been burned by this fuel leaking from the ship. Now all of these chemicals have dissipated and no one in our dive party reported any ill effects. This ship was also transporting heavy equipment used for building runways. We saw a bulldozer with a huge winch on the back, compacters and tractors. There were also a lot of bottles, as there were on most of the ships we dived. Because of the extreme depth, we went into a few minutes of deco time. This is not a problem unless you have not been regularly monitoring your air supply. If you have burned too much air to complete your deco, you have a very real problem. Max. depth - 140 feet; dive time - 38 minutes. Dive Two was on the Kansho Maru. It was being repaired at the time of the attack and did not contain much cargo. However, as with all the other wrecks, there were numerous dishes, bottles, rubber soles of shoes and other everyday items strewn everywhere. Betewen took us through the crew's quarters, the galley and the bathrooms. The galley had a tiled floor that looked like it could have been laid last week. The bathrooms still had the urinals hanging on the wall. All of the wrecks were loaded with marine life. On this dive, we saw a beautiful nudibranch, Peterson's shrimp, threaded angelfish, and a pink anemone fish (a type of clown fish). Max. depth - 98 feet; dive time - 41 minutes. After a delicious lunch of lasagna, we made our third dive of the day on the destroyer Fumitsuki. It rests on the bottom in about 125 feet of water. According to the "Wrecks" book, the name "fumitsuki" translates into "the seventh month of the moon calendar when rice flowers". And who said the Japs weren't romantic! The Fumitsuki is one of the few warships in the lagoon. Most of the others fled the scene when it was learned that American aircraft carriers were on the way. You can still see the huge tubes that launched torpedoes from the bow. There were also a lot of other implements used for launching depth charges. On the bottom were a lot of shell casings, glassware and, of course, bottles. Jack Melton found an ambrotype but couldn't make out the image. Max. depth - 126 feet; dive time - 31 minutes. The Emily Flying Boat was the next dive. It was a good, relatively shallow dive for the last one of the day. This was a huge, heavily armored plane used for reconnaissance operations. It seemed kind of strange to see a giant plane lying on the ocean floor. Max. depth - 54 feet; dive time - 56 minutes. After two days of diving on eight different wrecks, everyone in our dive boat was amazed at Betewen's ability to locate the wreck sites. For example, the trip out to dive the Fumitsuki took about an hour over some very rough water. But Betewen put us right on top of a submerged buoy marking the site that was barely visible under the water. He does this without a modern GPS unit or even a compass. He just knows the area that well. Supper consisted of ham, baked potato, peas and carrots. After supper every night, a night dive was offered. This night it was to the tanker Hoyo Maru, sitting in relatively shallow water close to Fefan Island. It is lying upside down and the bottom of its hull is only 15 feet below the surface. 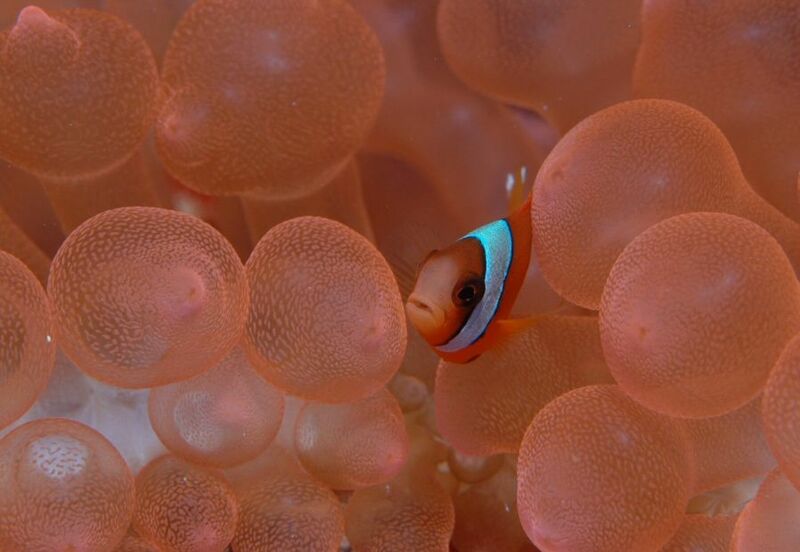 The hull is absolutely covered in all kinds of brilliantly colored hard and soft corals. Marine life was everywhere. The glowing eyes of many different species of shrimps were constantly in the beam of your dive light. We saw several orange and white-banded cleaner shrimp crawling around. These things look very weird! A very large spiny lobster tried to escape from all the commotion. Julian Brooke got several pictures of him. We also saw a sea turtle. Though it was an enjoyable dive, Steve said he didn't like it for a night dive. He saw several places where a diver could unknowingly penetrate into the hull of the ship. Very dangerous! Divers must constantly monitor their surroundings and know they can make a free ascent to the surface in case of emergency. Max. depth - 56 feet; dive time - 59 minutes. After our second, very full day of diving, one of our divers was locked out of both of his computers. Divers aboard the Thorfinn have the opportunity to make up to five dives per day, with a couple of these being deep dives in the 140 to 160-foot range. Nitrogen loading may be high. For this reason, it is imperative for divers to have two quality dive computers. Just as importantly, the diver must be proficient at using his or her computer. Failure to do so will, at the least, result in missed dives, and, at the most, could result in the diver's death. Wednesday, the third day of diving, began with a cup of coffee and a sweet roll at about 5:30 am. Then it was time to prepare for the day's activities. The recharged dive light had to be put back in the BC, and the camera had to be recharged and assembled. Then it was time to go diving. The first dive was a return trip to the Fujikawa Maru. It would take many dives to see all there is to see on this ship. Max. depth - 94 feet; dive time - 46 minutes. Next we dived the Yamagiri Maru, a large combined freighter/passenger liner lying on her port side in 110 feet of water. The Thorfinn's sketch of the wreck shows a large torpedo or bomb hole in her starboard side. It was loaded with 14-inch artillery shells and heavy equipment. On this dive, Betewen led us two by two into a compartment of the ship and shined his light up at the ceiling. There, embedded into the bulkhead, was a Japanese skull. This sight is somewhat surreal to say the least. The eye sockets of the long-dead seaman's skull stare blankly back at you as if to question what you are doing there. It was good to have other divers nearby with strong HID lights. Max. depth - 100 feet; dive time - 46 minutes. After lunch Betewen took us out for another dive on the Hoyo Maru, the ship we dived the previous night. Steve was right about the danger of penetrating the ship without knowing it; there were several large holes along the bottom that a diver could slip into at night without ever knowing it, until it was too late. Instead of the last dive of the day, a large group of us went on a tour of Eten Island. The Japanese used their labor force to construct a runway on the island that actually extends out into the sea. The entire island looks like a giant aircraft carrier. As soon as we disembarked, we were greeted by a familiar site: kudzu. The Japanese occupiers must have brought it with them. After securing the boat, our guides led us along a well-worn trail past a house, actually more like a shack. An older woman, teenaged boy and a baby were outside the house. They just smiled at us and stared. Continuing on the trail, we passed several large bomb craters, piles of discarded coconuts and banana trees with big bunches of green bananas. We went right by a clothes-washing party. Three women were bent over tubs washing their clothes by hand on a rub board, just like it used to be done here about 75 or a hundred years ago. They were hanging them out on nearby bushes and tree limbs to dry. They really got a kick out of us looking at them and taking pictures. They would speak to each other and just howl with laughter. Finally we reached our destination; a large concrete structure overgrown with trees and weeds. This was a Japanese communications center during the war and it was heavily bombed. It was amazing to see what our bombs did to solid concrete that looked to be at least a foot thick in places. Of course our little group drew a lot of attention from the locals. One little boy was running around naked. A very old looking man with a walking stick just stood around and stared. Imagine the stories he could tell about the war! Another woman in a brightly-colored dress posed for pictures in her tapioca garden. Returning to the boat, the sun was just going down behind Fefan Island in the distance and it made a beautiful backdrop for pictures. After dinner, we went back to the Kansho Maru for a night dive. The highlight of the dive was a bright neon-colored star puffer fish trying to sleep inside one of the holds. It was about 24 inches long and about as big around as a volleyball. It would let us come right up next to it and pet it. It felt all squishy like a big floating bowl of Jell-O. Ascending up the anchor line, it was cool to look back down on the ship at all of the other divers and their HID lights shining in all directions. They looked like a bunch of aliens hovering around the mother ship. Max. depth - 115 feet; dive time - 36 minutes. Thursday started with a dive on the Seiko Maru, a 392-foot cargo ship. It lies upright on the bottom at about 160 feet. The main deck is about 130 feet. The bow mast extends upward to within 45 feet of the surface, and is covered with all types of beautiful hard and soft coral and some clownfish, which proved very hard to photo. Max. depth. - 154 feet; dive time - 37 minutes. Our next dive was back on the Heian Maru, which we first dived on Monday. On this dive we were able to explore a different area of the ship. Max. depth - 106 feet; dive time - 46 minutes. Some of the fish species seen on the first two dives of the day: Sweetlips, Bleeker's Parrotfish, Reef Pipefish, Marbled Grouper, Skipjack, Sweeper, Freckled Hawkfish, and a little 2-inch long Goatfish. After lunch we dived the Sankisan Maru and it was an excellent dive. We dropped down into the forward hold among thousands and thousands of bullets, clips and machine gun belts. There were still wooden boxes sitting there still full of ammo. Artillery shell fuses were scattered about, and made some interesting photos. Next we entered a room with the floor covered with broken china and bottles. Rubber shoe soles, from which the leather had long since rotted from, were stuck on the side of the bulkhead. Why they were stuck there nobody knows. Other areas of the ship looked like they had been charred. A very interesting dive. Max depth - 75 feet; dive time - 39 minutes. Our last dive of the day was on the gunboat the Dai Na Hino Maru. This ship is little more than a large pile of jagged scrap metal after being hit by two of our large bombs. Not many artifacts, but there were some good grouper hiding out in it. Some excellent shells were found around the wreck, especially by Greer Geiger, who found about ten nice cowrie shells. Greer, Perry Massey and Spencer Phillips were the best cowrie finders. Steve Phillips also found a few. Max. depth - 64 feet; dive time - 53 minutes. At the breakfast table every morning, Captain Higgs would bring us up to date on what was going on in the rest of the world, for those that wanted to know. While we were diving, he kept us informed about the Terry Schiavo case, the Pope, and the deaths of Howell Heflin and Tom Bevill. Today our first dive was on the Amagisan Maru, which was a combined passenger/cargo ship. It is a deep wreck, so we weren't able to spend a lot of time looking her over. The forward deck is at about 80 feet and slopes to the stern at about 180 feet. It had about the best bow gun of any of the wrecks. Max. depth - 162 feet; dive time - 42 minutes. Next we dived the Gosei Maru (FYI: "Gosei" translates into "five star"). The stern of this wreck is only about eight feet deep while the bow drops down to about a hundred feet. Hence the nickname of this wreck: "The Stern-High Wreck." It had a lot of artifacts scattered everywhere. Some of the best china was on this wreck. Max depth - 111 feet; dive time - 44 minutes. Our last dive of the day was on the Rio de Janeiro Maru. It was a huge ocean liner converted into a submarine tender. It lies on its port side in about 100 feet of water. This monster is way too big to see in one dive. It contained thousands of beer bottles and sake bottles, many of them still in their original wooden boxes. Max depth - 99 feet; dive time - 54 minutes. This morning we dived probably the best wreck yet. The San Francisco Maru is a deep wreck and you don't get much time to look at all the tanks, trucks, cars and land mines, but it is fantastic! When we arrived at the wreck, a boat from the Odyssey was already tied into it, which caused trouble to be discussed later. So Betewen tied our boat to the Odyssey boat, which meant that we had to swim against the current to their anchor line for our descent. Even though the current was very slight, it's best to take it very slow and easy on a swim like this to conserve air and prevent fatigue. The wreck is definitely not going anywhere, and your dive buddies will wait for you. Betewen lead our descent. Because it was such a deep dive, he carried an extra tank just to be safe. We hit the ship's bridge at about 120 feet and moved toward the bow. A blue-spotted stingray skidded across the deck. Just below us at 160 feet were a couple of small, three-man tanks crashed together. One of the turret hatches was open and you could look in and see the controls. Only a very small man, even for a Japanese guy, could fit in there and operate the cannon. These tanks were very interesting. According to the book "Wrecks of the Truk Lagoon", these are Japanese Light Type 95 HA-Go Tanks made by Mitsubishi. They weighed only 10 tons, had a 3-man crew, were equipped with a 37-millimeter cannon, and could reach speeds of up to 28 MPH. Don Sublett, a member of our dive party, was a tank commander in Vietnam. For comparison purposes, his tank was a M48A3, weighing 52 tons with a 4-man crew. It was armed with 90-millimeter cannon and could reach speeds of up to 40 MPH. Looking down into hold No. 2 just forward of the tanks you could see three trucks. The "Wrecks" book says that two of these are tanker trucks and the third is a flatbed. It also says a bomb or torpedo trolley is next to the trucks. Continuing on toward the bow, we dropped down into hold No. 1 and stacks of hundreds of anti-personnel mines. Steve said that the hold use to be crammed full of these mines but the locals had removed many of them to blow up fish with. At the bottom of hold No. 1, we were at about 190 feet, our deepest dive of the week. We could not stay at this depth. We could only drop down for a look at the mines and then ascend. At this extreme depth, nitrogen narcosis is a real danger, especially for inexperienced divers. Some said they couldn't feel it at all. I personally was aware of it. It felt like my whole body was buzzing, like electricity running through it. Coming out of the hold, it was time to locate the anchor line to ascend and decompress. When we got up to about 15 or 20 feet, an unfortunate incident happened. The Odyssey boat had left and cut our boat loose. We were just drifting. Luckily, only three members of our party were still in the water. Two of these were holding onto drop lines from the boat, but the third guy, Terry Banks, swam to the point of exhaustion in an attempt to catch the boat. He finally just surfaced and the boat picked him up. Turns out that Betewen wasn't even on the boat. We weren't sure what happened but it was a very serious blunder. Good thing that Terry kept his head and was in good shape or an unfortunate mishap could have turned into a serious accident. Max. depth - 189 feet; dive time - 41 minutes. Our next dive was on the Yubei Maru. She is in very poor condition. The "Wrecks" book reports that she was hit by a 1,000-pound bomb and at least one torpedo. As usual though, there were plenty of colorful corals and fish to look at. Max. depth - 100 feet, dive time - 24 minutes. The last dive I made from the Thorfinn was on a tanker named the Shinkoku Maru. Before being requisitioned by the Japanese Navy, the Shinkoku was used to transport oil from the U.S. to Japan. The Japanese used her at both Pearl Harbor and the Battle of Midway. The name "shinkoku" means "divine country." We divined her right to the bottom of the ocean. This was a good dive, a must dive. The telegraphs on the bridge, covered with hard and soft corals and anemones, made outstanding pictures. There were a lot of medicine bottles scattered around, and an operating table still standing in the infirmary. Max. depth - 96 feet; dive time - 42 minutes. Thus ended our diving on the Thorfinn. I had made 24 dives on about 20 different wrecks. All in clear, currentless, 85-degree water. No wonder Truk Lagoon is known as the best wreck diving in the world! Now it was time to visit Secret Island. After a great week of diving the wrecks of Truk, our group was ready to un-wind and spend some time on our private island. We departed the Thorfinn for the 40 minute boat ride loaded with 21 divers, supplies, and scuba gear in four different skiffs. From a distance you could see a spec of paradise on the horizon. Lots of coconut trees and plenty of shade. This remote island (ours for the next 3 days) is one of hundreds scattered across 800 miles of lagoon virtually surrounded by reefs that make up the Federated States of Micronesia. Like most islands, we had a nice leeward side with calm water, the other side was exposed to more wind, a little rough, the reef extended much farther out especially during low tide. The island has about 12 cottages; all with double beds and large windows that let the night breezes come through. It was very relaxing; you could hear the trade winds and best of all, no bugs. There was a generator that ran most of the night, although we really didn't need it other than to turn the lights on. We had hired several of the Thorfinn staff to cook for us. Our igloo coolers were full of ribs, chicken, salad, rice, sodas, beer and more rice. Steve had made a run to town the day before and bought everything needed to feed the group. There was a small building that had a propane gas grill stove where some of the meals were cooked, but our dinners (ribs/chicken) were cooked on an open fire next to a tin roof hut where the group ate. The first day of shore diving we were trying to decide which side of the island to dive first, the windward or the leeward side. There was about 6 people from the group (Steve, Spencer, Perry, Terry, Greer, and Don) that had stayed on the island before on Southern’s last Truk trip. They told us about the reef sharks on the windy side that lurked just over the edge of the reef in shallow water that appeared out of nowhere. Great photo opportunity, "but take the rusty metal spear poles just in case". That meant about a 100 yard walk with equipment in shin deep water on hard corals till we reached deeper water on the other side of the reef. We still geared up, after all most of us were 1st timers to Truk, we had to try it at least once. Spencer assured us that the hard corals were in better shape on this side. Before we new it we had a group of about 12 ready to go. Several guys went out to snorkel first, Dennis, Bob, Peter, Rick, and Julian. They found some blue starfish on the way and saw a few sharks once they cleared the shallow reef on the other side. We started diving, once we made our way over the corals, we ended up in about 15 feet of water. There were plenty of healthy large corals and sponges, giant clams, and some good macro stuff. Most of us saw at least 1 shark, and a few saw up to 5, black tips, white tips, and gray reef sharks. The ones I saw were headed in the opposite direction, a brief glimpse; there were probably too many fins and bubbles in the water for their liking. We stayed in shallow water for a while hoping to see more sharks, then gradually got a little deeper until we were around 60 feet. After the dive, we came back when the tide was pretty low. You really needed a good pair of hard sole boots, the coral was exposed out of the water and it was the hardest stuff we've ever walked on. Later that day we dove on the leeward side, nice easy diving, and we continued diving that side on our second day. Some of the group stayed together underwater and others dived by themselves. Toward the end of the dive Perry spotted 5 pipefish in one spot, not far away a nice size green moray swam from one coral mound to another. One thing that really impressed us about Truk's outer islands, there were large mounds of coral, different types clumped together and some really nice exotic shells. At night, some of the local fishermen would walk along the reef when the tide was out and catch baby octopus. It is considered a delicacy in Truk and they would load the buckets up. Also, we had some resident bats at dusk in the coconut trees, occasionally they flew around and we got some photos. It didn't take long to understand why the residents didn't want to stand under the trees; some of the coconuts weighed up to 10 pounds and would fall from time to time. You couldn't help but to glance up when walking along the paths around the island. We had a nice time on the island, this was something different, and you won't find our island in any brochures or travel agents office. Steve did a nice job putting the trip together, it's not easy to pull off, he's had 10 years worth of Truk experience and over 100 dives there, it’s not for everybody, but it was an adventure that will stay with us. A lot more happened than what I wrote about. We had a group of girls on the trip (Mary, Niki, Greer, Denise, and Eshaia) that I don't believe anybody heard complain one time. After all, there were no showers on the island and limited fresh water. What could be better than hanging out with a bunch of grungy guys? At least on our way to the airport we got a chance to board the Thorfinn again, grab a quick shower and finish packing our luggage. Our last night before we returned home was at Guam, we flew there after we departed the Thorfinn. Guam is the jumping off point to the other islands in Micronesia. We stayed at the Royal Orchid Hotel, it was nice, restaurants were in the lobby and we had a chance to rest up before our flight home. One thing you notice is the number of Japanese tourists. In the lobby was a Tony Romas, we were the only Americans eating there. Most of the Japanese ordered surf and turf and you couldn't help but notice how they took photos of their dinner. Maybe they weren't use to American super sizing. Guam is a good deal to the Japanese and fairly close, they vacation there like we do Mexico, and it's the number one place for weddings and honeymoons from what I'm told. In 1998, Forrest and I had the chance to visit Guam on our way to Palau. We were able to see the island and visit the museum dedicated to Sgt. Shoichi Yokoi, a Japanese soldier that spent nearly 28 years of his life hiding in caves on the island after the war in 1945. He would not surrender. In 1972, he was surprised and captured in a remote section of Guam. He did not believe the war was over. According to the museum, when he was returned to Japan he was still carrying his rusted rifle at his side and told the emperor, “it is with much embarrassment that I have returned alive." The museum still has his personal belongings, torn uniforms, and relics on display. Steve, Spencer, and I would like to thank everyone for a great time.